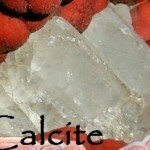 Agate is a cryptocrystalline form of quartz. “Cryptocrystalline” means that the crystals in the stone are too tiny to see individually. 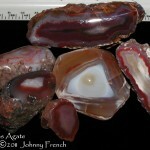 Agate is the quartz gem for which the Big Bend area is best known. 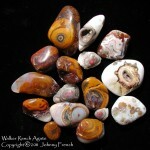 Agate is usually multicolored and at least partly translucent or transparent. The colors occur in patterns that are truly incredible. Some of the local agates are quite sought after: Red & black plume agate and Marfa bouquet agate are two examples which have tree-like or feathery formations of different colors in the agate. 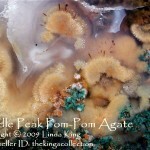 These plumes are formed in three dimensions before the background agate forms. 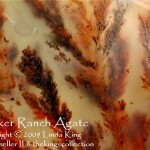 In addition, there are many other agate patterns found in this region, and each piece of agate is unique. Jasper is another form of cryptocrystalline quartz that is single or multicolored but not translucent. 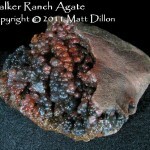 With some luck you might find a chunk of jasper as large as several hundred pounds. 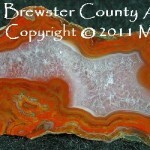 Jasper can be made into beautiful jewelry and other decorative objects. Colors found here are mostly the colors of iron oxides: red, orange, yellow, and brown. A little bit of green occurs, as well as light blue, and black. 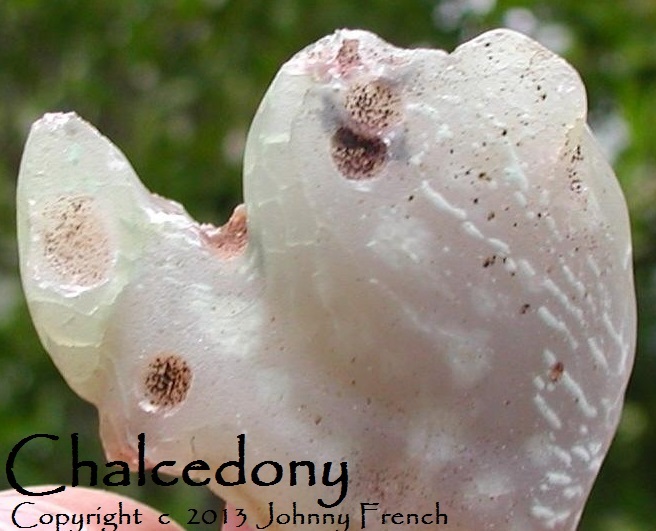 Chalcedony is a solid-colored, translucent form of cryptocrystalline quartz. 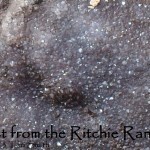 It occurs in many different colors in the Big Bend area. Most of the chalcedony nodules are white, gray, or light blue. When it’s bright green, it’s called chrysoprase; when it’s cinnamon to orange, it’s called sard. Red is carnelian. 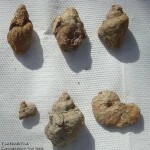 Pieces much larger than a jackalope egg can often be found. 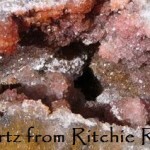 Quartz crystals appear in geodes or in seams. 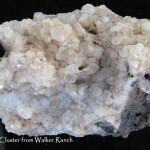 This area produces crystals that are clear (often called rock crystal), pink (rose quartz), yellow (citrine), purple (amethyst), and brown (smoky quartz). Individual crystals are usually very small, but when they cover an entire surface of agate or other rock they are called “druzy quartz”. 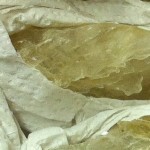 Beautiful specimens are abundant, and some individual crystals are big enough to be used in jewelry. Common and precious opal can both be found in seams where the opal filled in a void in the rock. Opal is a cryptocrystalline quartz mineral that contains more water than agate or jasper does. 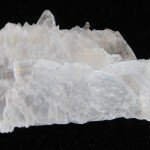 Common opal has no play (flashes) of color, and in the Big Bend is known to be white, peach, or light blue. Precious opal is very rare, and has a play of color caused by fractures within the stone itself. In the Big Bend, opal often appears as a number of small pieces within a volcanic “matrix”, which actually makes the stone stronger. The opal is fragile but can occasionally be made into good jewelry. 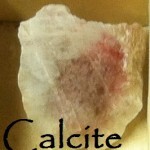 Calcite, aragonite and selenite appear as single crystals, in crystal clusters, concretions, etc. 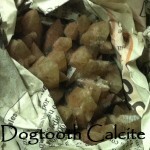 These are generally too soft for jewelry, but make beautiful specimens and may be utilized in sculpture. Labradorite, a yellow feldspar often called Sunstone, occurs as individual small stones. They “grew” in the volcanic basalt which cooled slowly enough for the crystals to form before the magma hardened. Remnants of large labradorite crystals can be seen adhering to the basalt in many places. The labradorite can be faceted into lovely gemstones. 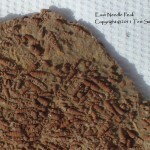 Fossils were originally parts of animals or plants. Often, these were buried in mud, and slowly their matter was replaced by rock such as limestone or quartz. These are most common near Terlingua and Big Bend National Park, which was once an ancient ocean. Fossils include shells, shark teeth, undersea creatures such as sea urchins and crinoids, and bones of vertebrate animals and huge marine masosaurs. 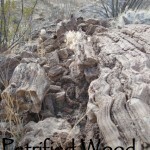 Beautiful petrified wood and petrified palmwood can also be found. Petrified palmwood is the Texas state rock. 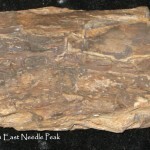 Most fossils make excellent specimens. 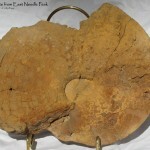 Some petrified wood and petrified palmwood can be cut, polished, and used for jewelry.